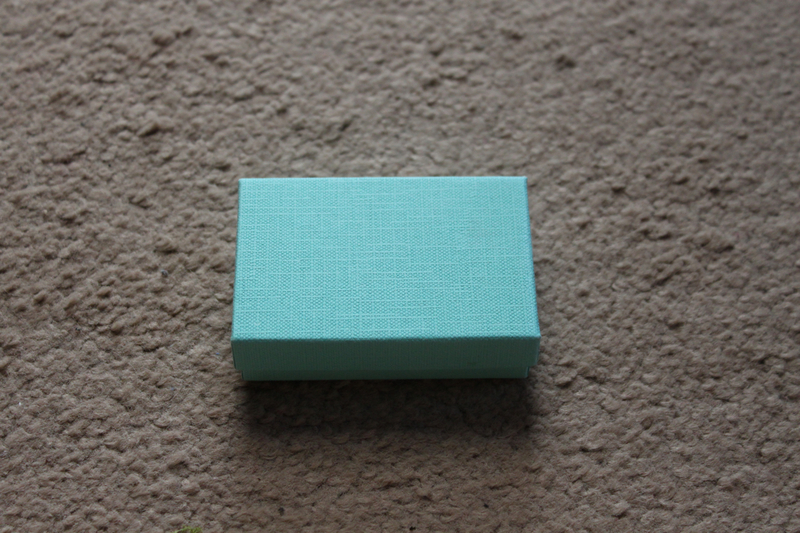 Peppermint Puff's Blog: I won my first ever giveaway...So he's a tiny review! I won my first ever giveaway...So he's a tiny review! I recently won my first ever giveaway! 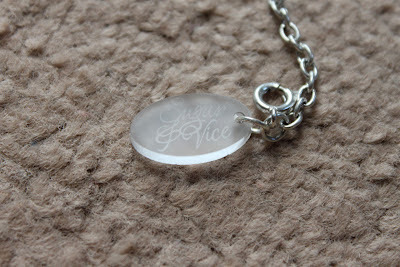 It was for a Sugar & Vice necklace over at JetleyMess' blog. I thought I would do a little review for anyone who might be interested in the company! I have been a fan of Sugar & Vice for a good while now, probably back when they first opened their Etsy shop. I am ashamed to say this is the only piece I have from them, although I have plans for many more, very soon! 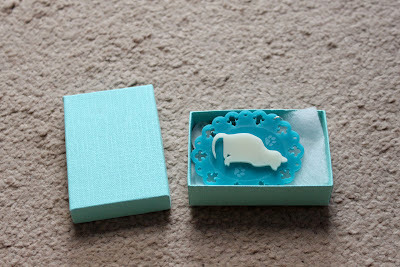 The necklace is really lovely, it's made from a turquoise acrylic setting with a fleur de lis pattern, engraved kitty paws and a white kitty in the centre! 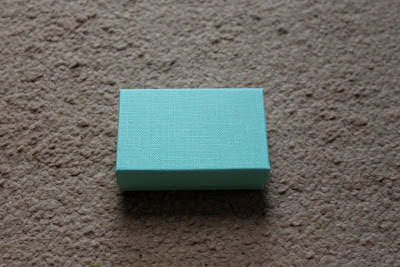 It's a nice big size, I love my jewellery chunky so I was really happy about this. Everything is of a really high standard. The chain has a little Sugar and Vice tag! 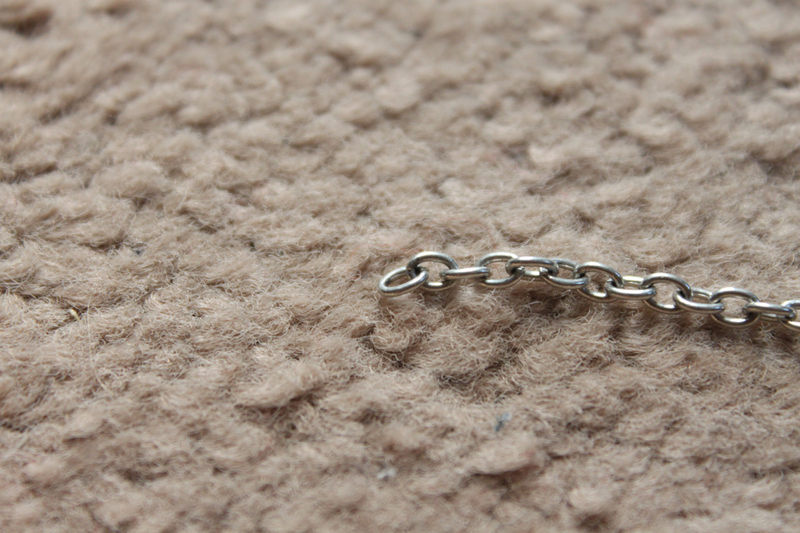 My only issue with this was that the little connecter that you use to close the necklace fell off before I had even gotten it on, although as everything else was well made, sturdy and high quality I'm sure it was a very rare occurrence. 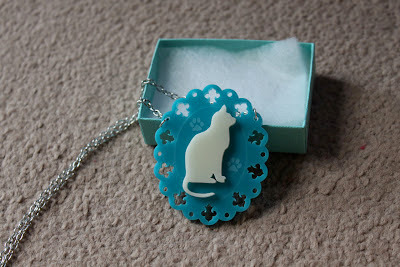 So I love this necklace, It's really lovely, I have my eye on about 10 items from their shop! So if my birthday (12th October *winkwinkhinthint*) would come a little faster that would be great! I fully recommend them, their communication on FB is wonderful, the items are very high quality and above all the pieces are truly unique!